Since starting Hypothyroid Mom over 5 years ago this topic has been the one to intrigue me the most. I have the good fortune of connecting with many of the world’s leaders in thyroid health and one topic comes up time after time. Infection. Often times chronic and so silent and difficult to pinpoint, these infections go undetected for decades with disastrous results. Are you suffering from unrelenting fatigue that doesn’t seem to respond to any intervention? Perhaps you’ve asked your doctor to check your thyroid function and it came back normal. Perhaps you’ve been testing for iron-deficiency anemia this, too, was normal. Or perhaps you’ve been told by an integrative medical doctor that your adrenal function is suboptimal. Maybe what you haven’t thought of is the fact that you could be harboring hidden pathogens in your body that are robbing your energy and stealing your steam! If basic testing fails to reveal a cause of your fatigue, you may want to have your doctor test for occult infection. More sophisticated investigations can reveal the presence of all kinds of pathogens capable of colonizing the body and evading the immune system. Some of them include: Parvoviruses, HHV6, Epstein-Barr, Cytomegalovirus, Mycoplasma, and Borrelia burgdorferi. Other patients have a history of chronic fungal infections or biotoxin exposure. A history of chronic mold exposure is a feasible explanation for such symptoms, as is the presence of B. burgdorferi. A study of 375 patients with apparently no cause for their disabling fatigue revealed pathological stimulation of white blood cells with abnormally elevated patterns of natural helper and natural killer cells, important infection fighting agents in the immune system in 53% of patients. It showed depleted levels of IgG subclass three in 59% of the study population. More than 50% had circulating immune complexes and many tested positive for ANA antibodies, usually seen in autoimmune diseases like lupus. Why is it that some patients who get an infection recover and have no fatigue and others may be colonized with pathogens and suffer from intractable lack of energy? It appears that part of the answer lies in the genetic polymorphisms or variances in our bodies response to infection and inflammation. 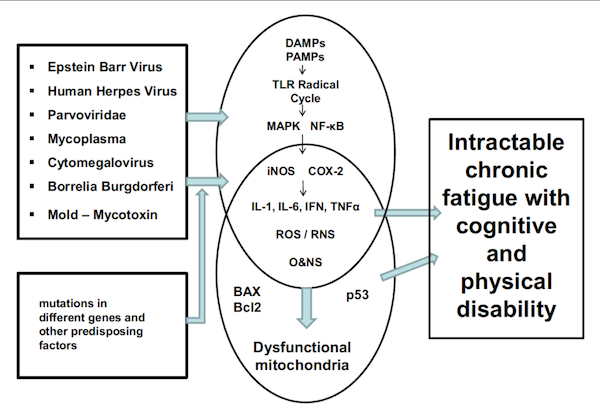 For those who develop severe fatigue in response to toxic exposure, like mold or infection, their immune systems respond more robustly to the threat with massive production of cytokines, like IL-ß1 or TNF-alpha. Moreover, polymorphisms in TNF-alpha,IL-1β, interferons (IFNs), IL-6, and IL-10, acting together or separately can make the severity and response of immune system more profound in response to infection. Why does this happen? Well these pathogens can trigger TLR’s (toll-like receptors) by either PAMPs (pathogen-associated molecular patterns) or DAMPs (damage associated molecular patterns). Activation of the TLRs causes a massive cytokine surge that becomes like a domino-effect and keeps on going unrelenting in susceptible individuals, contributing to the inflammation, depression and fatigue. This vicious cycle of pro-inflammatory cytokines that continue to trigger more inflammation and amplify the cycle, leading to more damage and inflammation. 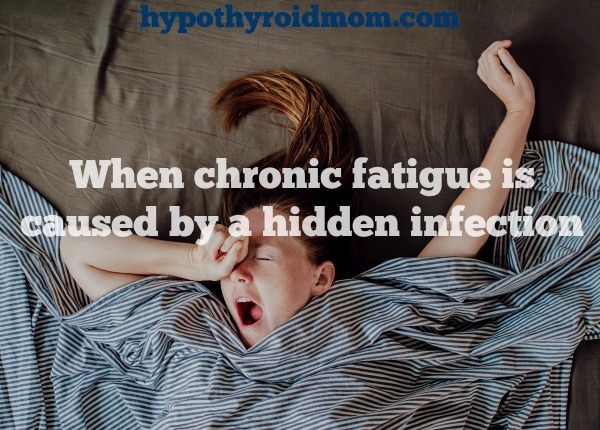 The initial infection followed by chronic inflammation of the immune system could explain the cause of fatigue in these genetically susceptible individuals. Some patients also suffer from cognitive dysfunction, memory loss, or brain fog as well. What are some common hidden infections that may be causing your fatigue? Chronic fatigue syndrome is just a label. It’s useful to identify a group of symptoms that causes significant fatigue and may affect one’s life dramatically causing inability to function or hold a job. It does not represent one clincial entity but the cause may be multi-factorial and different in each individual. It may share a final common pathway of dysfunctional immune activation and inflammation that keeps on going in a self perpetuating manner (like the Energizer Bunny gone bad!) From a functional medicine perspective it’s important to get to the root cause of the chronic fatigue symptoms and cognitive impairment. Most of these infections, including the inflammatory response (CIRS) to mold and mycotoxins can be measured by ordering conventional lab testing through a knowledgable practitioner. Ask your doctor to see if he can help you determine the root cause of your fatigue. Treating the root cause (or infection in this case) just might give you back your life! Dr. Jill Carnahan is board certified in both Family Medicine and Integrative Holistic Medicine. At her practice, Flatiron Functional Medicine in Louisville, CO, Dr. Carnahan uses functional medicine to help her patients find answers to the cause of their illness and the nutritional and biochemical imbalances that may be making them feel ill.
Great article! My daughter was diagnosed with chronic fatigue syndrome at 14 and prescribed awful and inappropriate drugs for her age … thankfully we found another doctor who didn’t accept that as her only diagnosis and looked further. She actually had a chronic mycoplasma infection! Don’t just accept a CFS diagnosis without further testing. She’s 18 now and the mycoplasma is gone, but she does have thyroid and adrenal issues. At least she is getting the care she needs. What happens after you get your test results and go over those results with your employees? If you need medication, how do you get it prescribed to you? Hi Stephanie, This is Dana Trentini from Hypothyroid Mom. If you mean thyroid medication, here is a list of resources to help locate good thyroid doctors by location.